Get ready for this one, friends! You will not believe how easy this dessert is and how simple it is to pull together. 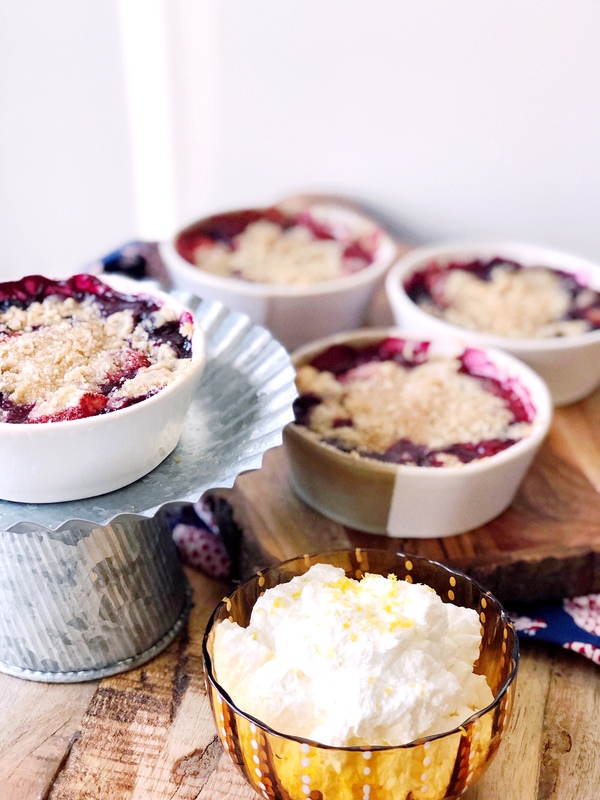 If you are in a pinch, need a quick idea, or just want to shake it up a little, try these mixed berry cobblers for dessert! Don’t let a crumbly topping scare you away from this one – it’s easy, promise! And the filling is literally just berries and sugar. C’est tout! I served these hot, out of the oven and topped with fresh whipped cream. The whipped cream melted into the cobblers and it was simply lovely. 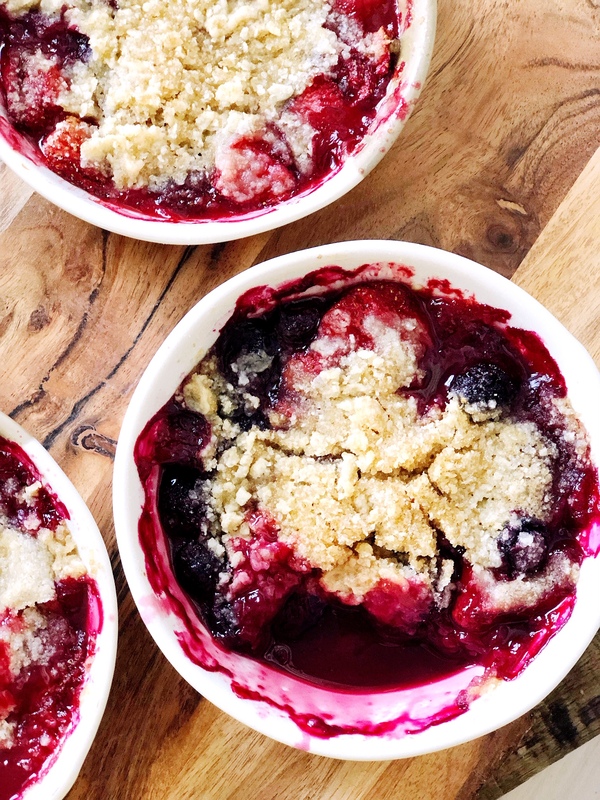 The cobbler topping baked into the sweet berries and gave a little saltiness and a little crunch that mixed so well with the baked berries. 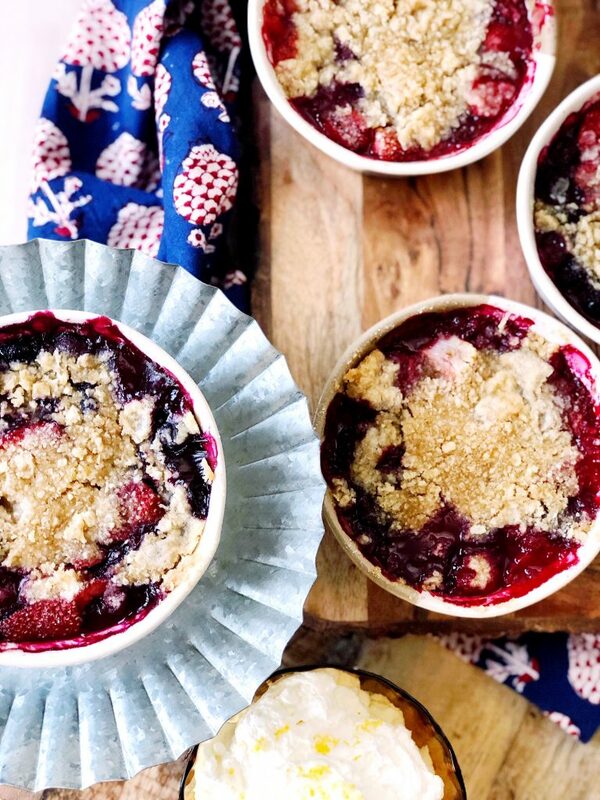 These bake up in about 35 minutes, and the cobbler comes together in about 5 minutes. You could even leave the strawberries whole to cut down even more on the prep time! I think whipped cream takes more effort. But serve these with vanilla ice cream. Does it get any easier? 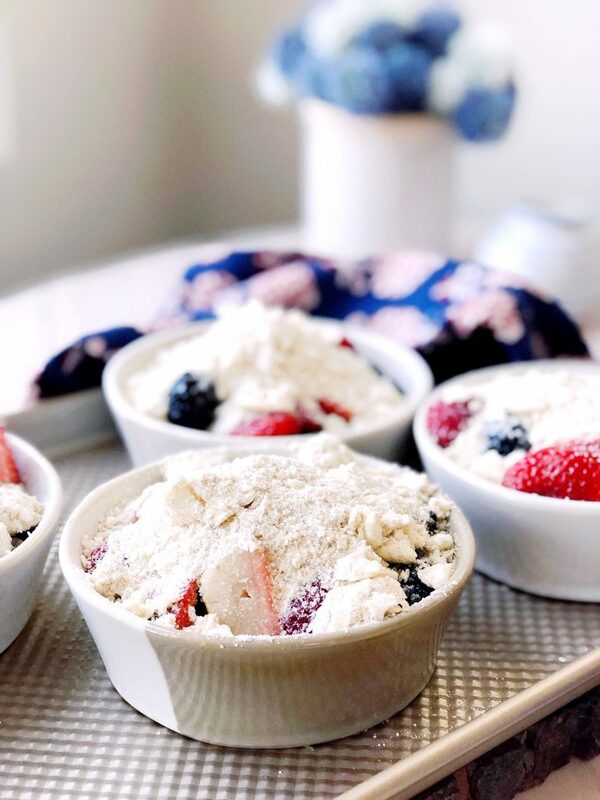 I scooped up four of these little baking dishes from Chrissy Tiegan’s Cravings line at Target. The exact ones I found are sold out but here is another style of the same size. A little ramekin will do, however, the Target website says these are 20 oz. 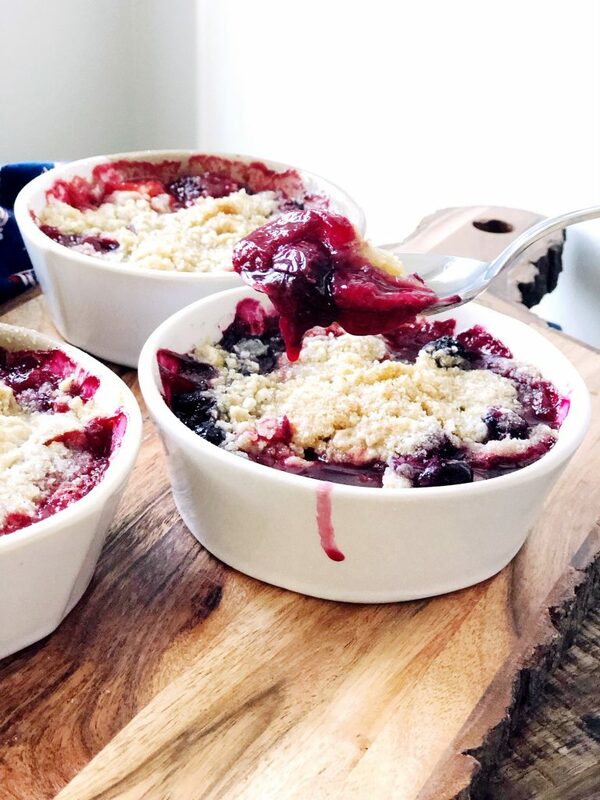 With the 20 oz baking dish, I was able to make 4 cobblers. And it wouldn’t be one of my recipes if I didn’t encourage you to do you, boo! You can put vanilla in with the berries, or lemon juice, or lemon zest, or different berries all together! You could ad cinnamon or nutmeg or both to the cobbler base. Let me know how you like these! You will be so surprised how simple this recipe is and how amazing it tastes! It bakes quickly and the filling is only 2 ingredients. Preheat oven to 350. Prepare ramekins with cooking spray or butter. In a stand mixer or in a mixing bowl, combine all ingredients until large, moist clumps form in the mixture. 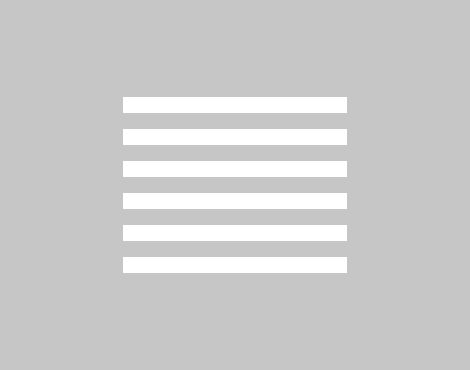 You can do this with the stand mixer or with your hands. Refrigerate mixture while you prepare your berries. 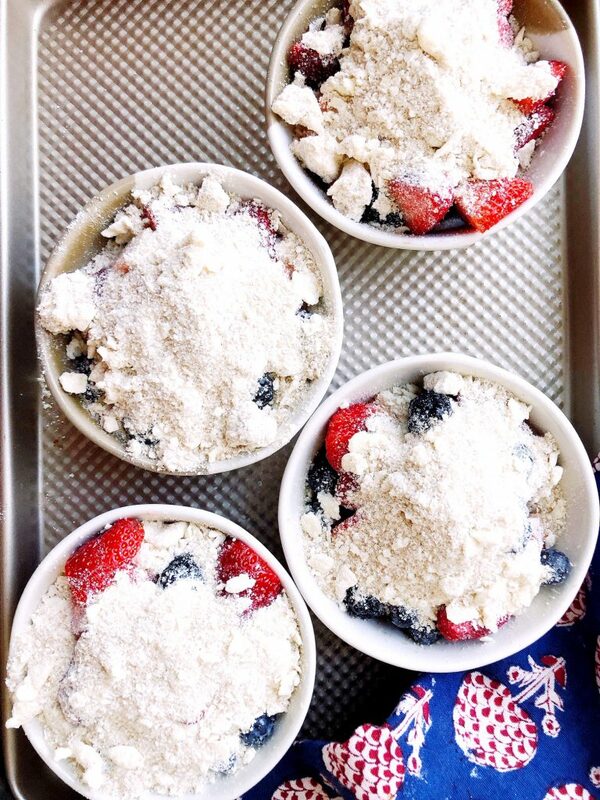 Place all berries in a mixing bowl, sprinkle sugar and lemon juice, if using, over the berries. Divide the berries between the baking dishes, getting a good mixture of all the berries in each dish. Top each baking dish with the crumble. Bake for 35 minutes or until filling is bubbling and the crumble topping is golden brown. Serve hot, warm or at room temperature with whipped cream or ice cream.